Hala, the Kahuna of Melemele Island, proudly tells you: “Only when you find the balance of the old and the new can you make something original.” I could not possibly invent a more clear or precise explanation as to why the newest installments to the Pokémon franchise shines so brightly; the Pokémon Company really has created an amazing balance of nostalgia and fresh mechanics within Pokémon Sun and Pokémon Moon. The story in Pokémon Sun and Moon start out much like all Pokémon games: You are a young trainer in a new region setting out on a quest to become the best trainer. Unlike previous instillments of the franchise, Pokémon Sun and Moon have a slightly different path to achieve that goal. As the Alola Region has no established Pokémon League, no gyms, and no gym badges to collect, you must instead embark on the Island Challenge. 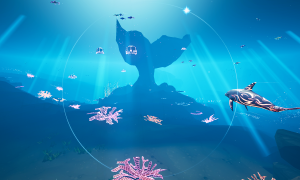 It may seem like semantics, but this is a distinct and refreshing change of pace, requiring you to take on challenges by Captains, which can test anything from your ability to solve problems, to your powers of observation; from your photography skills with Poké Finder (a miniature, in-game version of Pokémon Snap) to your ability to successfully command your Pokémon in battle. These challenges come in unexpected ways, at unexpected times, and have a refreshing mix of difficulty, ingenuity and humor. While trials include the expected battles with the Island Kahuna, a Gym Leader in all but name, they also require you to challenge an entirely new type of Pokémon: The Totem Pokémon. Totem Pokémon are giant, wild Pokémon which receive stat boosts from their aura. Capable of dealing some impressive damage and calling in other Pokémon for backup, Totems are not your average wild Zubat encounter, and can be quite challenging if you, like me, have difficulty deciding on a Pokémon team right from the start of the game. The story within Sun and Moon ventured into a darker, more emotionally charged territory than I had expected. Closer in feel to the narrative within Black and White or HeartGold and SoulSilver than the more recent X and Y, the plot comes together in a nice, if not entirely unsurprising way. I was impressed by the amount of character growth within the story, and how well various in-game plot lines came together. For the first time in my Pokémon career, I found myself incredibly eager to get my hands on the other version of the game, so I could see first hand how that side of the story looked and played out. Longer than many previous games, I beat the main story after 40 hours of gameplay, and have still barely scratched the surface of Guardian Deities, Ultra Beasts, challenging Red and Blue, and whatever secrets and excitement the post game of Sun and Moon hold. I can honestly say that no other Pokémon game has left me with the sense of victory, accomplishment, and celebration that this one achieved. I was elated to see a post-game tie in to the Pokémon Generations series, and am excited to see how Pokémon Stars, or even the rumored future DLC expansions, will shape the Alola Region. Graphically, the game is lovely, but clearly held back by the limitations of the 3DS. I was able to play Moon on both the original 3DS and the New 3DS, and while there was the occasional noticeable load time on the New 3DS, the original unit really struggled with the game, especially during Battle Royale and when generating weather effects. I was also surprised to see that the game made very little use of the 3D feature, offering 3D only while using the Poké Finder tool. The recent Eurogamer leak of Pokémon Stars, a third installment of the game which will be available only for the Nintendo Switch, offers some pretty strong insight as to why Game Freak would decide to make such limited use of the 3D feature, while simultaneously giving hope for even better graphics in the next release. Each monster is beautifully animated, and small details, such as rival trainers using different kinds of Pokéballs, speaks volumes about the care put into these games. Musically, fans seem to be split. While I’m of the “It’s good, but still doesn’t hold a candle to X and Y” camp, many players revere the music as the best Pokémon soundtrack to date. One thing’s for certain however: the soundtrack is still the same Pokémon goodness you know and love, just with a bit of an island twist. Sun and Moon has played a great deal of ‘cleanup’ with previous features and interfaces, condensing and relocating several features, while expanding others. O-Powers, a power up from X and Y, are gone, the Pokedéx is now a tip-spouting Rotom who auto updates your map with markers to help you get where you need to be, and Pokémon Amie has been renamed to Pokémon Refresh. Pokémon Refresh can now be accessed directly from the victory screen, and has been expanded to allow you to bond with and clean your Pokémon after battle, and can even be used to cure status ailments. Fashion is now simply about customizing your character, and berry farms, special training and even stone hunting has been moved to Poké Pelago, a system which lets your Pokémon stored in boxes explore islands, as opposed to being forever stranded in virtual storage. While it doesn’t solve all of the issues within Pokémon, all of this rearranging and adjusting makes for a much more organized, streamlined, and logical user interface. Perhaps the most exciting feature of all: HMs are a thing of the past! Players can now use the Ride Pager to traverse the Alola Region without having to fill the valuable battle move space of their Pokémon with the basic tools of travel. The new Ride Pager makes HMs a thing of the past! Of course, so much shuffling comes with a few losses, especially for shiny hunters. Hordes of Pokémon can no longer be summoned, the DexNav is a thing of the past, and chain fishing is no longer an option; the new S.O.S. Battle feature appears to be the only method of shiny hunting in Sun and Moon. Pokémon Breeders, on the other hand, have reason to rejoice: The daycare will no longer level your Pokémon or teach them new moves, and now gives each Pokémon an unlimited stay for a flat admission fee of 500 Pokédollars. After all these years and so many iterations of mainline Pokémon games, Sun and Moon’s greatest achievement lies in how well it strikes a balance between reinventing classic elements and providing a brand new direction for the series. More recent Pokémon games have felt stagnant and repetitive, but Sun and Moon is the freshest this franchise has felt in a long time. This is easily the most excited I’ve been about Pokémon in over a decade. One of the things I love most about Sun and Moon is how it heavily embraces nostalgia of the original Red and Blue generation. Given the celebration of Pokémon 20th anniversary and the success of Pokémon Go, attempting to present gameplay scenarios that welcome back players that have been absent since the franchise’s origin while streamlining gameplay was a fantastic design choice and one that Sun and Moon succeeds remarkably well on. This all starts with a player character who just moved to the island region of Alola from Kanto (where Pokémon Red and Blue take place), and is a great way to establish a relatable hero who can ease in returning players who have missed out on the many sequels since the series’ early roots. Sun and Moon’s first few hours begin with a surprising number of the original 151 Pokémon too, which is a great way of getting players reacquainted with some familiar faces. Even the new Alola region’s variant Pokémon come from the original generation adding another link to the series’ roots. These Pokémon variants are one of Sun and Moon’s best new features too. Seeing classic monsters take on new forms, all with both new appearances and Pokémon typings, adds an exciting new spin to the franchise that leaves an element of surprise whenever a recognizable Pokemon appears in a new way. Some of the new variants are admittedly much cooler than others – a new Fire/Ghost Marowak and Electric/Psychic Raichu get more mileage than the laughable new forms of Persian and Exeggcutor, for example – but there’s no denying the enjoyment of seeing how some beloved Pokémon react to the brighter sunlight of the Alola region. Sun and Moon feature a strong roster of new Pokémon as well. Aside from a set of starters that is arguably the most memorable since Bulbasaur, Charmander and Squirtle, the tropical-themed Pokémon of Alola stand out as some great additions to a Pokédex that now sits at over 800 strong. As with every new Pokémon generation, there are some duds in this lot, but new Pokémon such as Toucannon, an angry and threatening toucan, and Crabrawler, a literal fighting-type crab, easily rank as some of my favorite new Pokémon. Thankfully, Pokémon Sun and Moon provide a compelling new narrative with which to use Alola’s colorful new roster. Pokémon trainers in Alola set out to become the “Island Challenge Champion”, completing objective-based trials and fighting Totem Pokémon, which are stronger wild creatures under the care of Island Captains. These trials prove to be a far more varied experience than standard gym battles of the series’ past, while still requiring strong battle prowess and strategic team building to succeed. The Island Challenge all feels like a fresh take on the Pokémon League battles of old, yet still feels parallel to it in many key ways. The one sore spot of Sun and Moon’s plot comes in the form of Team Skull, the Alola region’s antagonists. Unlike classic villain teams like Red and Blue’s Team Rocket or X and Y’s Team Flare that threatening the safety of your Pokémon, Team Skull is just a band of street thug buffoons. The way they talk, the way the move, and a lack of any real sense of danger just make Team Skull feel more like an annoyance than an enemy. A lame villain on an otherwise compelling adventure, Team Skull easily ranks among the biggest video game dorks of 2016. Sun and Moon also boast some great new innovations to gameplay. For starters, the battle menu is far more informative than it’s ever been before by displaying battle info such as weather effects, stat changes, and how effective each available attack would be on your opponent. Having this information handy goes a long way for trainers who have previously needed to keep each battle’s changes and type match-ups in mind. Other changes, like the ability to switch out a newly caught Pokémon directly to your party can be huge time savers, while having Pokémon which can be called upon to traverse the environment replace the need for HMs and no longer bog down valuable roster space on your team. None of these enhancements are game changers, but they are hugely helpful and intuitive ways to streamline gameplay. I admittedly went into Pokémon Sun and Moon worried that too much was being changed. I feared how the removal of Pokémon gyms would get rid of the series’ sense of competition and worried that the island setting wouldn’t provide enough differentiation among monsters. All of those fears were unwarranted – the Alola region is an exciting new experience that brought out the inner child in me and made me remember how special Pokémon can be. Conquering the Island Challenge may feel different than the Pokémon League, but it’s exciting enough in fresh new ways that I didn’t care. Add in an excellent collection of new and modified Pokémon, and I’m once again in love with one of my favorite childhood franchises. Sun and Moon are the best Pokémon sequels since Gold and Silver and an excellent example of how to rejuvenate a franchise. Pokémon Sun and Moon are the most refreshing and exciting updates to the Pokémon franchise to date. Having found an impressive balance between old and new, providing both nostalgia and innovation, Pokémon Sun and Moon are a must-play for any Pokémon fan. 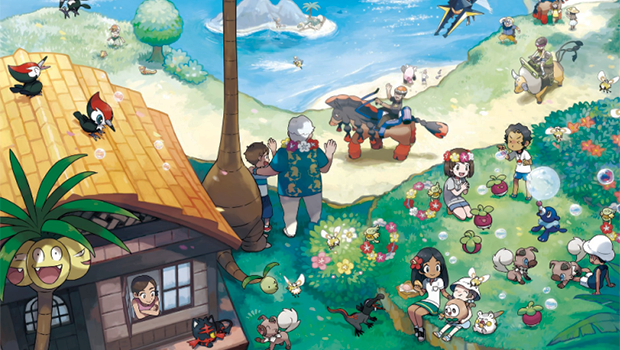 With depth which is surprising and not obvious early on, a new path to becoming the best, and entirely new ways of getting around, there are plenty of reasons to explore the Alola Region.